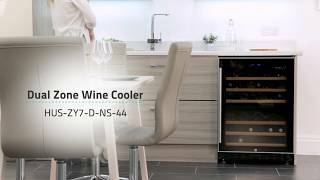 If you are looking for purpose designed wine storage, with a larger capacity, the HUS-ZY7-D-NS-44 Signature Wine Cooler is made just for wine lovers at home. At 595mm wide and 875mm high, the wine cooler is the standard width to be included as an undercounter in the kitchen, yet is also suitable for free standing use in other entertaining rooms of the house. Slide out wooden shelves chill up to 44 x 75cl wine bottles so this cooler is ideal for any wine enthusiast to display their prized collection. The compressor-driven performance provides a dual zone temperature storage function that is digitally controlled via a touch screen. This allows chilling of different wines at the same time but at totally different temperatures. The upper zone has a temperature of 5-12°C and a capacity of 24 x 75cl bottles. The lower zone has a temperature of 12-22°C and has a capacity of 20 x 75cl bottles. The elegant glass door with black outline and aluminium trim contains features normally only seen in high-end wine coolers. These include UV-safe glass to help protect your wine collection, subtle interior lighting and a replaceable carbon filter to protect your wine from bad odours. 126kWh per year, based on standard test results for 24 hours. Actual energy consumption will depend on how the appliance is used and where it is located.